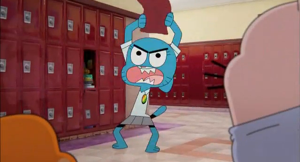 Nicole in Rage. . Wallpaper and background images in the Nichole Watterson club tagged: photo mad angry mom cat nicole nicole watterson the amazing world of gumball. This Nichole Watterson photo might contain 전화 부스, 전화 상자, 전화 키오스크, 전화 박스, 거리, 도시 현장, 도시의 설정, 도시 장면, 도시 설정, 도시 거리, 도시 장면 설정, 기호, 포스터, 텍스트, 칠판, 사인, and 서명.